An astonishing 1.3 million rounds were consumed by Remington in the extensive redesign and torture-testing of the R51, which was released on August 12, 2016, according to Remington's Director of handgun development, Mike Keeney. I did not test or review the original 2014 model, so everything documented here pertains only to the current product. The R51 is the gun that changed Remington Arms: http://www.randywakeman.com/TheR51PistolRemingtonsGreatest.htm . The original purchasers of the 2014 release model were all rewarded by Remington for their patience with a Pelican hard case, the new model with extra magazines, the lifetime warranty that now comes with all Remington product, and Remington even paid FFL transfer fees on top of that. The 9mm concealed carry handgun market is a crowded one, today, but a vibrant and growing market, and it looks to stay that way for a long time. There are several 9mm pistols out there worthy of your consideration. The smaller and lighter they get, the less comfortable they are to shoot, so that's a compromise that everyone needs to decide for themselves. Since the Glock revolution of 1982 onward, things haven't been the same. I've used the same Glock 19 since the late 1980s. We've all seen various designs modified or dropped in favor of a copy of the Glock Polymer 2 frame and the addition of the Glock “Safe Action” trigger. The Glock influence is clear in two recently covered single stack 9mms, a Ruger and a Walther. The previously tested Walther PPS M2 is about a 1.32 pound handgun, unloaded, with a 3.18 inch barrel: it has a 6.1 lb. trigger. It sells for about $425 street price. It is not rated for +P ammo. The Walther comes with a “Legendary Lifetime Warranty” that promises a 48 hour turnaround. 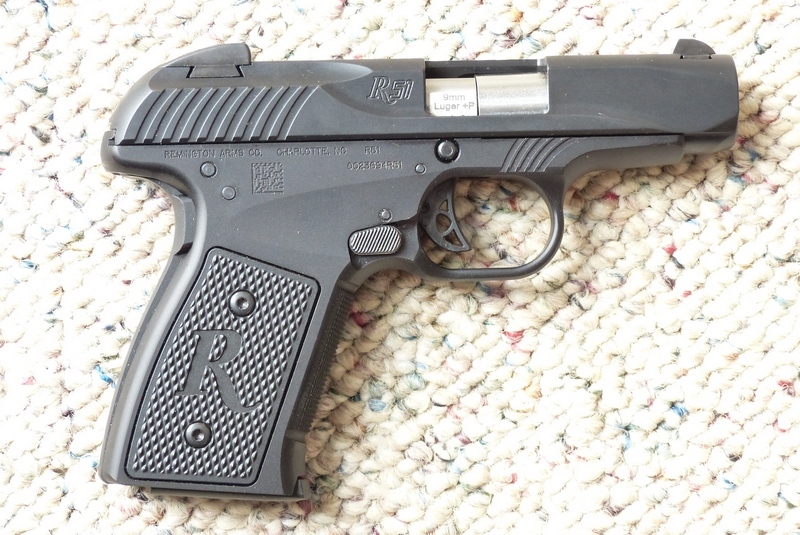 The previously reviewed Ruger LC9s Pro weighs 17.2 oz., the trigger breaks at 5 lbs. 2 ounces, and sells for about $350 street. The Remington R51 comes complete with a second 7 round magazine: notable as the Ruger 9 round magazine, for example, is ridiculously overpriced at $44.95 + $8 for Priority Mail from Ruger. You read this right, it is $52.95 to get a 9 round magazine direct from Ruger: too bad there is no easy self-defense against this stunt. A second 7 round Ruger mag is still around $40 by the time it gets to your door from various sources. From Ruger, it is $39.95 + $8 shipping. I can't think of anyone that wouldn't want at least a second magazine. I'm as guilty of sudden bursts of frugality as anyone else, but sometimes we do shop a gun to death, but don't look at total acquisition cost. All of a sudden, that $350 or $400 handgun we thought was a good deal is $400 - $450 due to something as basic as a second magazine. The Remington R51 trigger as tested breaks at just over 4 lbs as measured by Lyman digital gauge. The R51 itself weighs about 1.4 pounds and it has a 3.4 inch barrel. It come with a written lifetime warranty. It also sells for about $350 street, though naturally the individual retailer sets their own price: I've seen them as low as $335. The Remington R51 is quite a bit different from most compact 9mm pistols, starting with the hesitation-locked action of John Pederson. John Douglas Pedersen had 69 patents to his credit and was called “the greatest gun designer in the world” by John M. Browning. The R51 has neither a plastic frame nor a Glock style trigger array. The frame is aluminum alloy and the trigger is a light, crisp single stage trigger. As a direct result of the metal frame, the R51 has very good balance, avoiding the top heavy and muzzle heavy feel of many (most) polymer framed guns. Many 9mm pistols have plastic guide rods, like the Ruger LC9s and the Walther that some replace with various aftermarket steel guide rods. There is no separate guide rod in the Remington R51. The R51's slide is easy to rack and it has a grip safety, that dispenses with all the usual levers as well as the Glock style trigger. Squeeze the grip, it will go bang when you pull the trigger. Don't squeeze the grip, the trigger is blocked: it doesn't get much easier than that. For complete reliability, a new magazine needs to have three full loadings shot through it. As good as any gun can be, a magazine can stuff you up without the requisite minimal break-in. 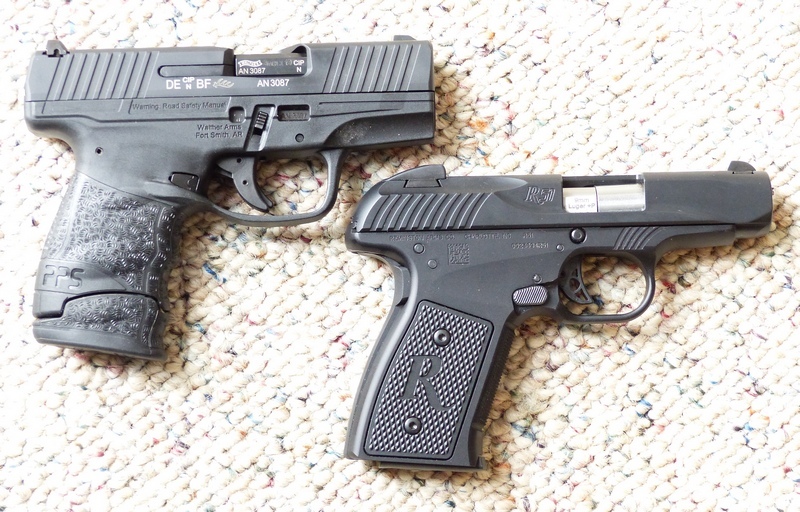 You'll notice that the Remington R51, as compared to the Walther PPS M2, has far less initial take up on the trigger and a lighter trigger to boot. This is as compared to most all Glock “Safe Action” triggers, whether on the Walther, the Ruger LC9s, or my Glock 19. 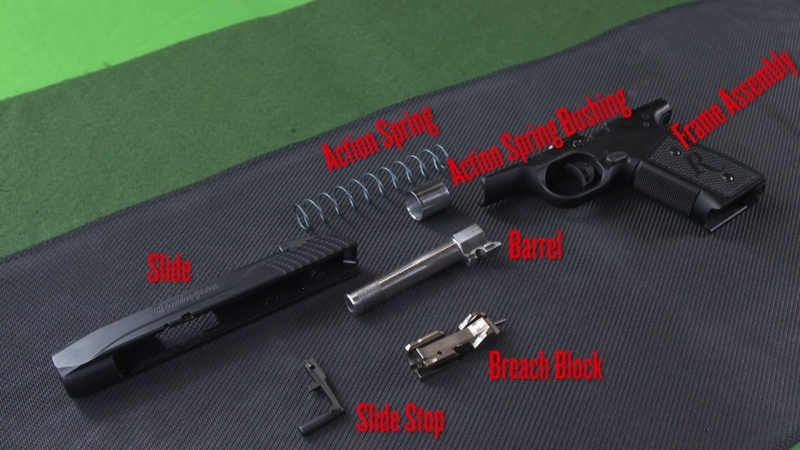 Unlike the Walther, Glock, etc., the Remington has an ambidextrous magazine release. The Remington also has a stainless steel barrel as opposed to the carbon steel barrel of the Ruger and is rated for +P ammo, which the Walther is not. Another thing that most folks will readily appreciate about the R51 is the magazines, not just because two are included, but because they drop out more freely than on most pistols of this type. Many magazines just dribble out when released: some come out an inch or so and hang up. The Remington R51 ejects empty magazines. Disassembly of the Remington R51 is not difficult. Now, I'm not as quick about it as Travis Tomasie is, but after you do it a couple times it becomes straightforward. It is not as quick as taking apart a Glock or the Walther, but I'm not the guy that would ever bother with trying to strip and clean a handgun in my trunk. The R51 sights are the fairly common and popular 3 Dot sight array, well done. Remington does offer an R51 Crimson Trace laser grip model. Sighting options are naturally personal preference: mine is generally the XS Sights Tritium set. A debate about the better-looking concealed carry pistol doesn't make a heck of a lot of sense, but nevertheless the Remington R51 does have very nice lines, reminiscent of the Walther PP as opposed to the blocky glob look of many compact 9mm Lugers. My example R51 is mar-free, with no sharp edges and clean machining throughout. The frame and the slide have their respective black finishes well and evenly applied. When you take your new R51 apart for the first time, it will look like it has been shot. The reason is that it has been, several times by Remington at the factory prior to shipment. The R51 has a host of features that makes it very appealing, including the essentially all-metal construction, excellent balance, stainless steel barrel, +P ammo rating, low muzzle rise, the light and crisp trigger, two magazines supplied, and the lifetime written warranty. In the sub-$400 compact 9mm arena, as long as it fits you, the Remington R51 is the best value out there.